High performance cars and a standing seam roof system ...what's the connection?When engineers at Lotus developed the chassis for the Elise, our industrial designteam worked to perfect a fastener capable of joining different metal types, whilstmaintaining shear resistant joints. 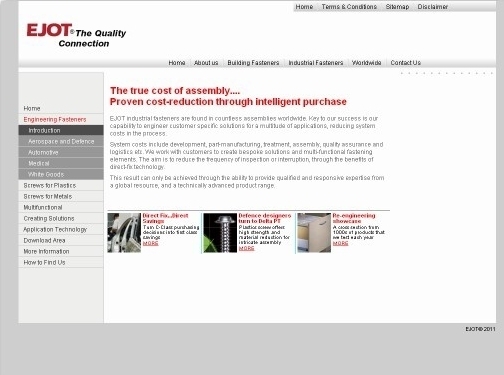 EJOT industrial fasteners are found in countless assemblies worldwide. Key to our success is our capability to engineer customer specific solutions for a multitude of applications, reducing system costs in the process. System costs include development, part-manufacturing, treatment, assembly, quality assurance and logistics etc. We work with customers to create bespoke solutions and multi-functional fastening elements. The aim is to reduce the frequency of inspection or interruption, through the benefits of direct-fix technology. UK (Leeds) based company offering fastener products for business. Website features a catalogue of their products, a download area, terms and conditions and full company contact details (under Contact Us).